Dimmit County Courthouse in Carrizo Springs located off U.S. Highway 277. 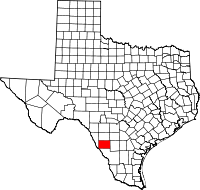 Dimmit County adalah county yang terletak di negara bagian Texas, Amerika Serikat. Jumlah penduduk pada tahun 2000 sebesar 10.248 jiwa. Read Philip Dimmit's entry in the Biographical Encyclopedia of Texas hosted by the Portal to Texas History. Historic Dimmit County materials, hosted by the Portal to Texas History. Halaman ini terakhir diubah pada 27 Oktober 2016, pukul 08.07.